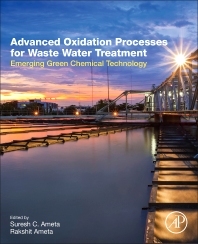 Advanced Oxidation Processes for Waste Water Treatment: Emerging Green Chemical Technology is a complete resource covering the fundamentals and applications of all Advanced Oxidation Processes (AOPs). This book presents the most up-to-date research on AOPs and makes the argument that AOPs offer an eco-friendly method of wastewater treatment. In addition to an overview of the fundamentals and applications, it details the reactive species involved, along with sections on reactor designs, thus helping readers understand and implement these methods. Prof. Suresh C. Ameta has served as Professor & Head, Department of Chemistry, North Gujarat University Patan and M. L. Sukhadia University, Udaipur & Head, Department of Polymer Science. Now, he is serving as Dean, Faculty of Science, PAHER University, Udaipur. Prof. Ameta is a former President of the Indian Chemical Society, Kotkata and is currently Vice President. He was won a number of prizes including 2 for writing Chemistry books, a national teacher award and a Life Time Achievement Award by Indian Chemical Society. He has successfully guided 75 students for Ph. D. Dr. Ameta has more than 350 research papers and 36 books to his credit plus numerous chapters. He has completed 5 Major Research Projects by DST, UGC, CSIR, Ministry of Energy, Govt. of India. His research areas are - Waste Water Treatment, Photochemistry, Green Chemistry, Microwave Assisted reactions, Environmental Chemistry, Nanochemistry, Solar Cells. Dr Ameta has teaching experience in the field of Chemistry as well as Industrial Chemistry and Polymer Science. 5 Research students have been awarded Ph.D. degree under the supervision of Dr. Ameta and presently, 7 Ph. D. students are working for their research on various aspects of Green Chemistry. He has around 101 research publications to his credit in journals of National and International repute. He has a patent also to his credit and two more are underway. He has chaired sessions in conferences held by Indian Chemical Society and Indian Council of chemists. Dr. Ameta was elected as Council Member and Associate Editor, Physical Chemistry Section of Indian Chemical Society, Kolkata and Indian Council of Chemists, Agra. Recently, Dr. Ameta has been elected as Scientist-in-Charge in the Industrial and Applied Chemistry Section of Indian Chemical Society for next three years. He has written 5 degree books and has contributed chapters. His research areas are - Waste Water Treatment, Photochemistry, Green Chemistry, Microwave Assisted reactions, Environmental Chemistry, Nanochemistry, Solar Cells, Bioactive & conducting polymers.